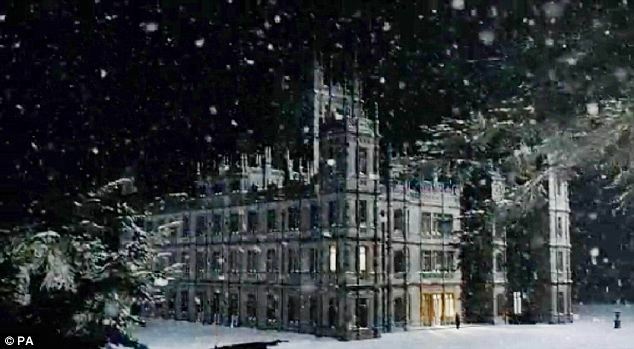 Happy Downton Christmas! There were so many holidays and special events in this episode – Christmas (with a lovely Christmas pudding), New Year’s, shooting, and the Servants’ Ball. 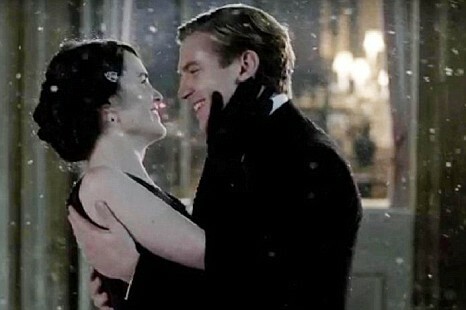 How nice that the last episode of Downton Abbey Season 2 is a Christmas special. It almost makes up for the fact that the season is over. Almost. 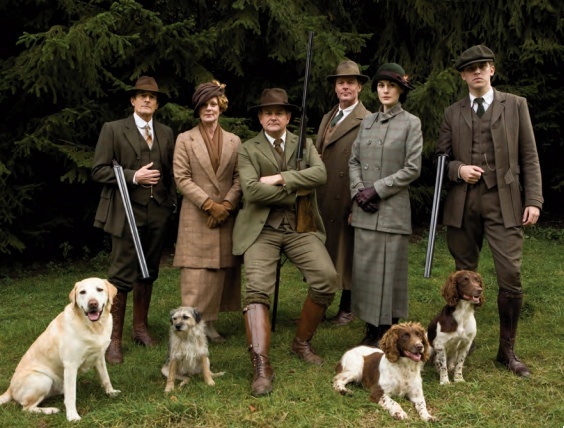 I’d been wondering when there would be a good shooting episode since it’s such a classic, and Downton already had a fox hunt in the first season. 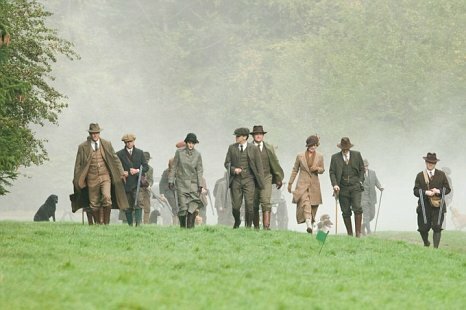 This day’s shooting was especially good because it allowed Lady Mary to insult her fiancé Sir Richard some more for being vulgar, and it also let her spend more time with Matthew in a pastoral setting. The later set of fisticuffs between Matthew and Richard was just the star on the Christmas tree. I know I’m probably in the minority with this one, but I really felt for Sir Richard. I think he sincerely loved Mary, and he tried to help his almost family the way he knew how – by keeping the Bates scandal out of the papers at great inconvenience to himself. He was really just super jealous that Mary and Matthew were still being all googly-eyed with one another, so it does seem hard that she puts him through that and then breaks off the engagement anyway. Not only that, but he had to endure Christmas at Downton and watch them all play “The Game” which his lot just calls charades. I think it would have been more interesting if they had made Mary at least kind of like Richard, and show her being torn between her class and his new one. But no, Richard’s was probably just a one-sided love. Granny’s parting shot to him wasn’t even that good considering that Cousin Isobel gave her a Christmas present to use to crack her nuts. At least he and Mary parted on not so bad terms – classy, Mary. He’ll always remember her pantomiming The Tenant of Wildfell Hall (a pointed allusion, I think, to her sordid past which is affecting her present romance), and he’ll always have his profit from selling Haxby. Oh dear, did I just mention money? Even with Richard out of the picture, the course of Mary and Matthew’s love did not run smooth. Even the sweet, dead girl, Ginger Lavinia, wasn’t the main thing coming between them, but Pamuk. Lady Grantham finally told her husband about that terrible experience, and he broached the subject with Mary. This was probably one of my favorite scenes in the whole season, and it totally restored Lord Grantham to his place of being the perfect aristo and a decent man and father. I don’t even think he would have done anything differently if he hadn’t also had an indiscretion with Jane – all is forgiven. He was so sweet when he suggested she visit her grandmamma in America to ride out the scandal, and bring back a real cowboy from the Middle West (please tell me that’s the plot of Season 3 – I’d die to see that). Now that her father knows and still loves her, of course Mary can confess to Matthew. She aptly brings up Tess of the d’Urbervilles and compares them to Tess and her disloyal lover Angel Clare, thereby showing that literary Mary likes her some shocking novels and that she sees herself in grandiose terms as a tragic heroine. But there will be no tragic heroines at Downton this year: Matthew proves himself more broad-minded than Angel and proposes. You know what she says. Elsewhere at Downton, Anna (who knows women) was put through the wringer with Bates’ trial for wilful murder, in which he had the worst witnesses ever. He was found guilty, but then reprieved by the Home Secretary meaning that next season will probably find Anna playing lady detective to find out how the late Mrs. Bates actually died. I’m glad Anna has a pseudo-happy ending, but I would have loved to see her and Mary live it up in New York and Newport. She and Mary make a good passive-aggressive team, like when she revealed that Aunt Rosamund’s suitor was really after the lady’s maid. First Sybil and Branson (parents-to-be now), now this – those two really don’t like the upstairs and downstairs to mix. Thomas continued to get into scrapes in his quest to become the Earl’s valet, even stooping so low as to hide Isis the dog and then losing her. But his faulty plan was rewarded because when he appeared all mussed up, he impressed the Earl and got the job. He’s moving up in the world. Also, that scene when Lord Grantham came upon Thomas with his hair all covered in twigs reminded me of the scene in Pride and Prejudice when Mr. Darcy meets Lizzy after she has just walked to Netherfield to inquire after Jane. Is there more romance in the air? Maybe for Lady Edith. My heart bled for her a little when she told her old suitor Sir Anthony Strallan that she was not going to give up on anyone who called her lovely. There was some Ouija board fun downstairs which got Daisy (does she have a tragic past?) to get over her William guilt, got her a new friend in her father-in-law (who gives her good advice on how to get a raise and promotion), but also allowed Lavinia some last words (that was her with Anna and Daisy, right?) directed towards Mary and Matthew, twirling around in the snow. And that’s where we left Downton, at the start of 1920. 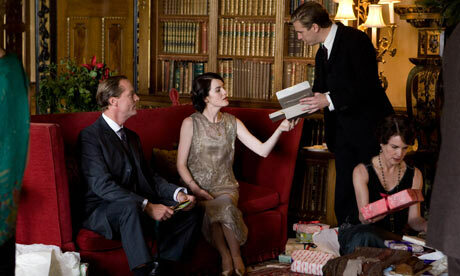 And what is to become of our beloved Crawleys and their servants (besides Downton Abbey Season 3, that is)? Something tells me that they’ll be doing pretty well for themselves. A few of the actors are part of the “corset crew” which is what one UK paper dubbed a tight-knit clique of up and coming actors under 30 who had struck it rich in period dramas such as Downton or Great Expectations (coming to PBS in April!). There’s Jessica Brown Findlay (Lady Sybil), who is in the coming-of-age film Albatross which was released in the States in January and who will next be seen alongside other corset crew members in the adventure miniseries Labyrinth where she will be searching for the Holy Grail in modern and medieval France. Sure, why not. Laura Carmichael (Ethel) was just in Tinker, Tailor, Soldier, Spy, Sophie McShera (Daisy) was recently in the hit play Jerusalem, and McShera’s flatmate, Zoe Boyle (the unfortunate Ginger Lavinia) has guest-starred on American TV shows such as Grey’s Anatomy and Sons of Anarchy. She was living with the scullery maid? How could Cousin Matthew have overlooked that. Amy Nutall (Baby Mama Ethel) might not be in the next season, but who cares when she has such an amazing voice? She played Christine in The Phantom of the Opera when she was just 17. How could they not let her sing in the show? What a waste – things might have turned out differently for her if they had heard her sing. The corset crew member I’m the most interested to see in his next project is Dan Stevens (Matthew, naturally). He actually had one of the posher upbringings, which should serve him well in Amy “Clueless” Heckerling’s new movie, Vamps, about two socialite vampires (Krysten Ritter and Alicia “Cher” Silverstone), where he plays Wallace Shawn’s son, Joey van Helsing. It’s a little embarrassing how much I’m looking forward to this movie. So it looks like Michelle Dockery (who was my favorite) is as much of an uppity minx as Lady Mary seeing as how she is not in the club. However, she probably isn’t sweating it since she’s continuing in period piece mode with a role in Joe Wright’s new production of Anna Karenina starring Keira Knightly. I would have liked to see Dockery play Eliza Doolittle in Pygmalion where she was supposed to be wonderful. I guess she can do high and low. Penelope Wilson (Isobel) and Maggie Smith are in an upcoming movie together, The Best Exotic Marigold Hotel – let’s hope they get along better in that. 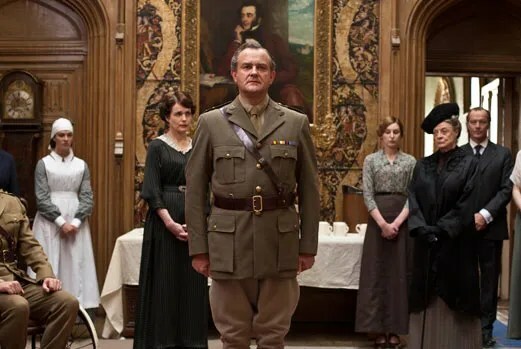 As for Julian Fellowes, he has the new Titanic ITV1 miniseries coming up which will be shown on ABC in the US, and features some familiar faces – such as Maria Doyle Kennedy (Mrs. Bates). He’s also adapting the screenplay for the new Romeo and Juliet movie starring Hailee Steinfeld and Douglas Booth (a corset crew member – it’s like a cult). But he’s so versatile – books, movies, TV, even musicals – that I doubt these will be the only things he’s up to. Oh, and I guess he’s busy being a baron, now. How authentic for the creator of Downton Abbey. The war is finally over! But that hardly means that Downton’s troubles have ended. We have intrigues, threats, Sullen Cousin Matthew, and even death. So much drama. This episode found Sir Richard “Absolutely Never” Carlisle and his coerced fiancée estate-hunting (Is the name of the estate, Haxby, supposed to sound like “hack” and refer to Sir Richard? Is that the kind of paper he publishes? ), and stepping on quite a few toes in the process. The Earl thinks it’s insensitive and tacky to buy neighboring homes from fallen aristocrats – but apparently marrying American ladies with large fortunes is perfectly acceptable. 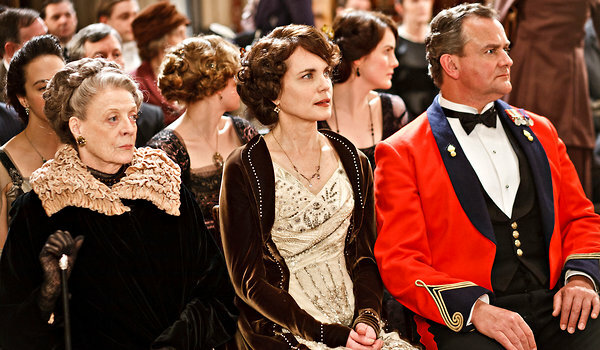 Carson doesn’t want to leave Downton to become their new butler. And Lady Mary doesn’t like that the house in question is unfurnished, and that Sir Richard’s “lot” would have to furnish the place with purchased (heaven forbid!) items rather than heirlooms. Snob and a half, no? Mary, you made your soup, now slurp it. It doesn’t cost me anything to say this, but I’ve become so partial to Sir Richard “Absolutely Never” Carlisle, even though this season I actually believed more in the Mary-Matthew loveline, and despite him being slightly abusive. It was so poignant and slightly degrading seeing him take part in Crawley powwows and looking so bored and bewildered while doing so. How many times did he ask “Should I be worried” and get completely ignored by everyone? I especially felt for him every time he mentioned the word “money” and Carson cringed. I wanted to shout at the butler “MONEY MONEY MONEY” but that wouldn’t have been very productive, I suppose. He’s tacky and nouveau, I get it, let’s move one. Maybe I’m too American. I think it’s no surprise that Sir Richard’s only Crawley ally seems to be Cora, the embarrassing American. He has some reason to be worried (though no excuse for threatening Mary and giving her a pretty awkward kiss) since Mary and Matthew are growing ever closer. I’ve never really liked Matthew much, but I welcome the new Sullen Cousin who appeared in this episode. I guess he had good reason to be sullen. I think Mary lightens matters by making fun of him being in a wheelchair – but in a flirty way. Lavinia’s return, with the help of Sir Richard (Anything going on there? Or is a travel delay just a travel delay?) and Cora, will probably put a damper on things, especially since she’s getting the manic glint of a fanatic as regards staying with Matthew. But wait – Matthew felt something! I respect him for hiding the fact until he knows more, but I respect Major Clarkson less for a bad diagnosis. Am I wrong to think that Fellowes was a fan of the Spike-in-a-wheelchair storyline in Buffy the Vampire Slayer, Season 2? As I feared, the neglected Earl is becoming more and more drawn to the new maid, Jane – the mother of the boy who is good at math. And really, could the Earl have been more undignified – eating sweets in the afternoon, bold as brass. At least Carson seems to suspect and disapproves of this intimacy. I still don’t know what her intentions are, but we’ll find out soon enough. I don’t appreciate the Earl getting all pissy with his wife, either. Just wait till her mother comes. Downstairs we found Daisy still being self-righteous over William (I’m getting over it) and Miss O’Brien being supremely creepy as she tried to suss out what Bates is up to – all to help, of course. I even feel a little sorry for Thomas, since he’s a little lonely now that his former partner in crime has other things on her mind. I exhibit no surprise that he’s thinking of going into the black market – but shame on him that Patmore thought of it before he did. He’s getting sloppy. And in plotlines that I didn’t really care about, Lady “I’ve Worn a Do-Rag in This Entire Season” Sybil continues to indulge in her boring and embarrassing non-tryst with the lamest revolutionary ever. Edith was occupied with The Stranger with No Face who claimed to be the dead heir apparent, Patrick Crawley (as I had thought). I didn’t really believe him, but mostly because that would have been too neat. The Crawleys would rule the entire county with Edith at Downton and Mary at Haxby. And Sybil would drive from house to house, I suppose. And before I forget, Mrs. Bates is dead! Of course I don’t suspect Bates, though he did leave something of a paper trail. In the previews it seems to be implied that arsenic is the culprit, and having read my Agatha Christie I know that poison is a traditionally feminine weapon. O’Brien, perhaps? It would be more exciting if it was Anna – that would give her more to do this season than repeatedly offer to ruin her reputation and be Bates’ mistress. 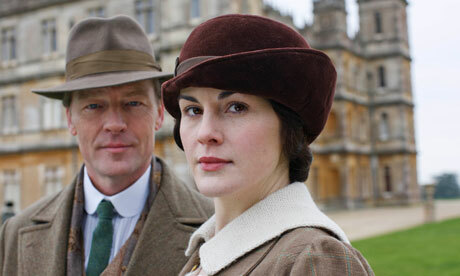 This episode could have been called Downer Abbey, or Death Comes to Downton. For the war has finally started to touch this estate in more palpable ways. We open with Cousin Matthew and William at Amiens, and instead of a fakeout like the last episode, this time they really are in danger. Matthew gets sent to the village while Granny Violet even uses the telephone in order to get William moved to Downton. That scene of her using the newfangled contraption was so cute – who doesn’t want a granny like her? I expected William to die since last season since his type of character always dies in these kinds of stories. Fellowes did not disappoint. I was very uncomfortable with the Daisy-William storyline since I don’t think it’s funny to coerce a girl into marriage, even if it might be the one thing keeping a man going during wartime. And even up till his death I still was on Daisy’s side – she’s grown up quite a lot since the first season when she had her misguided crush on Thomas. 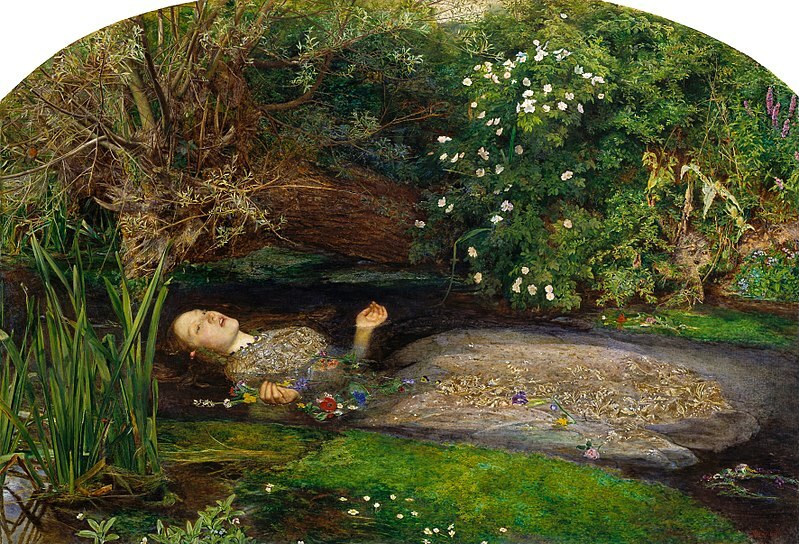 Still, how could you hate William when he was just thinking of providing for Daisy once he was gone (not to mention that his overly garlanded marriage/death-bed made him look like Sir John Everett Millais’ Ophelia). And it’s always nice to see people cheat the government. I actually think William had it easier than Matthew who suffered a spinal injury, rendering him impotent and unable to walk. Is the Crawley line cursed? At first I thought that Matthew’s marriage would go the Lady Chatterley’s Lover route, but Matthew released Lavinia from the engagement. I’m still not sure whether they were ever really in love. With Lavinia and Daisy, I wonder why Fellowes seems to like the idea of the virgin-wife. I actually don’t want to wonder about that. But Cousin Isobel came back, and it’s a testament to how much I felt for Matthew that I welcomed her return since I was glad that he had this comfort. When Lady Mary wasn’t being an exemplary nurse to Matthew (Isn’t it ironic that of the three Crawley sisters Sybil is probably the worst nurse? She should just run away with Branson – do us all a favor), she was dealing with the continued fallout from her indiscretion with Pamuk (hate him). Since Mrs. Bates turned up again, Lady Mary boldly decided to go to Sir Richard for help. Although he ribbed her about the affair, I think he actually likes her the better for it. And so they are engaged. I’ve actually become something of a fan of Sir Richard, despite his not knowing which tweeds to wear and generally being a social climber. I admit I have a weakness for the unscrupulous, rakish, and scrappy newspaper man (like Gail Wynand from Ayn Rand’s The Fountainhead or Clark Gable’s Peter Warne from It Happened One Night), but really, it was hard not to appreciate the publisher when he put Mrs. Bates in her place. That was pretty satisfying. We’ll see what kind of man he turns out to be. I think Miss O’Brien might turn out to be another formidable foe for Mrs. Bates because she feels guilty for having sicced that woman on Downton in the first place. I thought the scenes between her and Thomas were so funny – like squabbling siblings. I don’t even mind anymore that it looks like they won’t get theirs since they have grown up a little. They should use their powers for good from now on. And with Miss O’Brien and Thomas on their side, Mr. Bates and Anna should probably be married very soon. There was one thing that made me a little worried this episode: the new maid, Jane Moorsum. She might be lying about being a war widow just like Ethel, but I’m more worried that she has her sights set on the Earl. I didn’t exactly trust her when she “stumbled” upon Grantham alone in his remaining portion of the library, but I could just be paranoid. However, the man is feeling useless and neglected by his super busy wife, so who knows what might happen. So far he’s been portrayed as kind of the ideal aristocrat (Fellowes seems to love this type – he reminds me of Charles Broughton from his novel Snobs) so we’ll see how that holds. But if he does decide to stray, I’m sure Shirley MacLaine, who is set to play Cora’s mother, Martha Levinson, next season, will make him regret it. It looks like Mary will rethink her engagement in the next episode, but nobody jilts Sir Richard. There is also the appearance of the mysterious bandaged man that I have read so much about. I’m guessing it’s that cousin who was supposed to have died in the Titanic, because who else would be a good, relevant mystery man? Sidenote: I’m watching this on PBS with Laura Linney hosting. At first I found her strange, but now I think she’s underused. More Laura Linney, I say. This episode was pretty much, Cousin Matthew is missing…not. Of course I didn’t want him or William to be missing, but I wonder why they set that possibility up only to have it resolved so lamely with Cousin Matthew coming in while (HIGH RISK SCENE ALERT) Lady Mary was singing for the officers. If he hadn’t been supposedly missing, would people have been more mad at him for just coming in mid-performance and stealing the Crawley Sisters’ spotlight? He can be so like his mother sometimes. Speaking of Cousin Isobel, I was quite glad to see her do everyone a favor and ship herself off. Naturally I don’t want anything to happen to her in France (though she might come back with another husband just to make the doctor jealous – am I the only one who thinks that’s she’s totally feeling him? ), but I really disliked her. I’m no Cora fan, but I enjoyed the scene where the Countess totally modes her immensely. I suppose it’s a big deal that Bates came back to be the valet, but I actually felt sorry for Molesley since he looked pleased as punch at the thought of moving up in the world. And then Bates takes his shoe horn – insult to injury, no? And poor Ethel. Not only is she unemployed and pregnant, but the man she slept with does stupid magic tricks. You could do so much better, Ethel. At least you’re not boring like Lady Sybil and Branson. I’m glad Lady Edith is growing up and becoming nicer, even putting Major Magician in his place when she sees him get too friendly with Ethel. Are they never going to talk about her little pastoral interlude with that farmer? Did she just imagine that happening? And I hope that the previews for the next episode are exaggerating Lady Mary’s plight. It does seem to be certain that Sir Richard finds out about the Pamuk Affair, but I hope she’s not ruined completely – I think I’ve grown the most fond of her, after Maggie Smith, of course. But really Mary, you have a huge secret like this and you choose a newspaper man for a beau? Come on!